The Entente: World War I Battlefields is a real-time strategy game that is based in World War I and is created by a relatively unknown developer called Buka Entertainment. Unlike the current real-time strategy (RTS) games on the market at the moment, The Entente isn't based in some mythical Tolkein world or on an alien planet in the distant future or World War II and III, unlike its competitors the game is firmly based in the first war. The game revolves around World War I and is based on the military events from 1914 to 1918 that accurately portraits this turbulent time. The developers have given gamers a choice of five countries that they may play that include Russia, France, Germany, Austria and Britain. With 5 campaigns that are all uniquely different, the game also boasts a variety of specialised units that is specific of each country of the era. 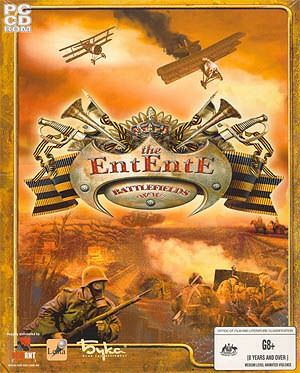 The Entente is a pure RTS game that revolves around a variety of non-linear missions and historical accurate battles that have players engaging in either the artificial intelligence of the game or other gamers. 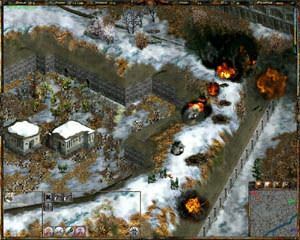 The primary objective of this title is a hunt and gather type scenario where players must gather various resources that include wood, iron, gold, oil, food and electricity that must be used to create and feed their powerful armies of World War I.
Novice gamers will be pleased to know that the game also contains various military and economic advisors that help control certain aspects of the game without it becoming too complicated. By collecting resources, gamers can create powerful units such as tanks and planes to engage the enemy of the time in some extremely powerful battles that really help show you how brutal the first world war really was. One of the most disturbing aspects of the game is the creation of chemical weapons such as mustard gas that really decimates enemy troops. As with all good RTS games, The Entente also supports various units and buildings that are upgradeable which help create more powerful structures and battle systems. One of the most impressive features of this title is the realistic artificial intelligence that really gave this veteran gamer a run for his money. The artificial intelligence doesn't just send troops after troops into your area but rather they are methodically placed on the maps and actually hide in various structures in the game. The game also contains a variety of units that include artillery, aviation, buildings, cavalry, fleet, infantry and vehicles. From the Renault FT17 Tank to the deadly Hussars of the Austrian/Hungarians empire, this game has it all! The gaming environments of The Entente is highly detailed and contains a variety of high resolutions from 640x480 to even 1280x1024 for those gamers who own powerful gaming systems. The developers have also done a great job at recreating the simplistic feel of World War I from the green countryside's to the units that grace this title. Graphically, The Entente isn't the most impressive looking title on the market at the moment but it sure does contain some amazing 3D landscapes that both the player and the artificial intelligence can use to its advantage. 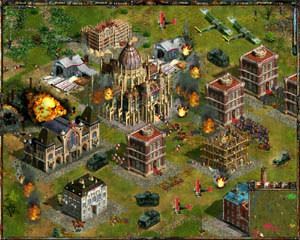 Apart from the beautiful backgrounds, the game contains some realistic 3D designed units from tanks, biplanes, soldiers and various other key military units of the time. The game also contains some great use of lighting that really help the explosions look extremely realistic and deadly. The buildings in the game have all been professionally designed and some of the war torn towns of World War I look like they have taken quite a bit of damage and really helps with the atmosphere of the title. 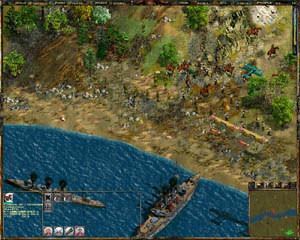 Another impressive feature of the game is that it only requires a Pentium 2 266Mhz, 128MB, 4MB 3D Card to play this game that ensures that a variety of computer owners can enjoy this title. The sound effects of The Entente contain the savage sounds of war from the powerful tanks of World War I to the deadly gunships that cruise the oceans, everything has been implemented perfectly into this title. The game also supports 3D Sound support that sound great from my Creative Lab speakers. Buka Entertainment may not be a widely known development company but I am sure that their current foray into the world of RTS games will help establish them as a powerful runner in this competitive world of gaming. Although the graphics engine of the game is visually impressive, it is a little too sparse when compared to the more modern titles of today. Fortunately, the game has faithfully recreated World War I perfectly with all the units and structures of the time. I would recommend this game to all gamers who love RTS games, especially for those that wish to play in a real-world genre and what better way is with The Entente: World War I Battlefields! Check it out!